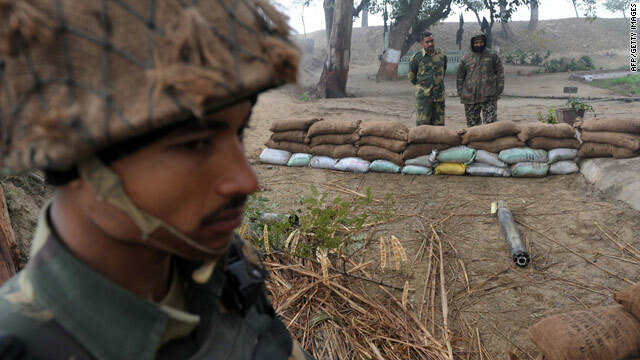 Indian soldiers stand guard near an unexploded rocket which India accused Pakistan of firing across the border. New DELHI, India (CNN) -- Indian border guards fired four rockets into Pakistan on Saturday in what they said was retaliation to a similar fire from the other side. Pakistan denied that claim. Two unexploded rockets were traced after midnight near an Indian outpost along the border dividing the Punjab region between the two countries, said K. Srinivasan, a deputy inspector-general of India's Border Security Force. "We have standing instructions to retaliate and retaliate heavily," he said, adding that Indian borders guards also fired about 50 gunshots. The firing has stopped as of now, he said. But a spokesman for the Pakistan Rangers said India's allegations were false. Nadeem Raza said that an explosion was heard at about 11:30 p.m., after which Indians fired mortars into Pakistani territory. Saturday's skirmish came a day after a long gunfight ended between Indian security forces and militants in Srinagar, the summer capital of India's Jammu and Kashmir state. The border between India and Pakistan is disputed in the Kashmir region, where India accuses Pakistan of fueling an insurgency. The two nations have fought three wars over the territory since their independence in 1947 and routinely exchanged fire along the border, known as the Line of Control, until a 2003 ceasefire agreement. But tensions between the two South Asian rivals, both nuclear powers, escalated after the deadly siege on Mumbai in November, 2008. More than 160 people were killed in the Mumbai assault, which derailed the peace process. The Indian government hinted Friday that Pakistan was behind this week's attack in Srinagar. "The two militants who were killed were in communication with their handlers outside India," said a statement issued by Home Minister P. Chidambaram. "The incident highlights the fact that the country, especially Jammu and Kashmir, remains vulnerable to militant attacks sponsored by forces from across the border." Chidambaram's comment echoed India's allegations that the terrorists who laid siege to Mumbai were in touch with their leaders in Pakistan by phone. CNN's Harmeet Shah Singh and journalist Umar Aziz Khan contributed to this report.